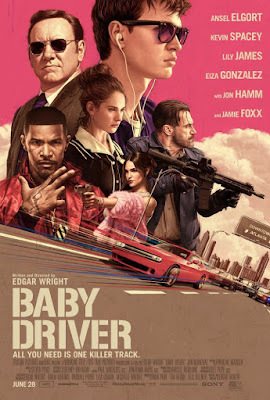 Its official, I am not an Edgar Wright fan. While there are still a couple of his films left to see, what I have seen have never worked for me and left me wondering why he is getting all of the praise he has. Such is the case with BABY DRIVER his long gestating heist film that critics went crazy for this summer. While the plot is nothing new, the reason to see the film are some really good set pieces set to a pop music soundtrack. Exciting and well choreographed the chases and shoot outs are things of beauty and they hold your attention as you wait to see what sort of great twist the Wright and his team have come up with for the next bit. On the other hand the film is a black hole character-wise with most of the characters barely registering. Everyone is playing types and not people with Ansel Elgort's Baby making zero impression and sucking the rest of the cast into his emptiness. And, to kick the film while it's down, it should be added the film's ation pieces are much too mechanical to be emotionally satisfying- we marvel at the mechanics not the danger because there never seems to be any. Any reaction to at happens is the result at a surprise at a twist instead of genuine suspense.